in a room stacked with waiting plates, my very own spoons. dressed early, cinched my grandmother’s gold on my neck. Pictures, my brothers laughing. Someone said, You should eat. Someone said, I will make you a trail of ashes. Me? of the front door hinge caused my heart to break. in the moonlight, that we walked all night. The wind had scattered the ashes. from one room to the next. And here is the finger with the ring still on it. This poem draws on two versions of “The Robber Bridegroom”: “The Robber Bridegroom,” The Grimm Reader: The Classic Tales of the Brothers Grimm, Maria Tartar, trans. and ed., New York, NY: W.W. Norton & Co., 2010, p. 129-133; and “The Robber Bridegroom” by Jacob and Wilhelm Grimm, D. L. Ashliman, trans. Read the story here. 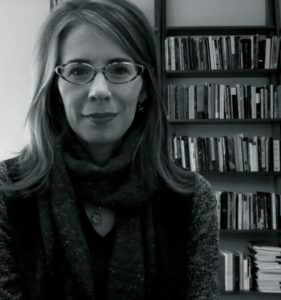 Molly Spencer's recent poetry has appeared in Blackbird, FIELD, Gettysburg Review, New England Review, and Ploughshares. Her critical writing has appeared at Colorado Review, Kenyon Review online, Tupelo Quarterly, and The Rumpus. Her poem, “Interior with a Woman Peeling Oranges, Snapping Beans,” won the Poetry Society of America’s 2018 Lucile Medwick Memorial Award. Molly holds an MPA from Columbia University’s School of International and Public Affairs, an MFA from the Rainier Writing Workshop, and is a Poetry Editor at The Rumpus. She teaches at the University of Michigan's Ford School of Public Policy. Her debut collection, If the house, is forthcoming from University of Wisconsin Press in Fall 2019. Find her online at www.mollyspencer.com.